All of us have dealt with a leaky faucet at some point in our lives, whether it was the kitchen sink, bathtub or just the outdoor garden hose attachment. But a small faucet leak can actually become a pretty big headache if the problem isn’t dealt with once you discover the problem. A dripping faucet that say leaks 30 drops per minute adds up to over 1,000 gallons a year of wasted water (and a bill you will pay for). Don’t let a leaky faucet ruin a floor, cause a stain or destroy a nearby appliance. There are a wide variety of faucets, and depending on the features and configuration, each install job will vary a little bit. But Streamline Plumbing takes great pride in offering upfront prices and full transparency, so call us today for a Free estimate and advice. If you need to install new faucets in your house just call us today for immediate help. Many homeowners have new faucets installed throughout their house just to make the rooms look better and newer, but there are hidden values to having new faucets. Obviously having upgraded appliances and fixtures will increase the value of your house. In addition a new faucet might be more efficient (no leaks) and lower your water usage, which helps lower the water bill. Either contact us online for a free estimate or just call us now to speak with one of our licensed plumbers and get answers to your faucet questions. Like all plumbing issues, faucet repairs come in all shapes and sizes. 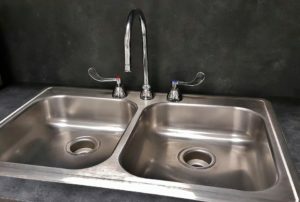 Some faucet repairs might just be a little drip, and another faucet repair might require replacing the entire faucet and connecting parts. Of course a faucet that leaks a lot is easy to spot and you’ll want to get those repairs take care of immediately, but even a slow dripping faucet could be an important repair that you need to handle ASAP. Many times faucets become clogged with mineral deposits that result in low water pressure or the ever annoying spraying of water from the spout. Broken handles can usually be replaced, but a cracked faucet might need the help of a professional at Streamline Plumbing to ensure your house in safe from water damage. Compression – uses rubber or plastic washers to seal the valve, and those washers wear out. Cartridge (sleeve), Ceramic Disk, Ball Type – these types of faucets are typically referred to as “waterless faucets” and can last longer, but they can develop leaks. If you have a faucet repair emergency you can call Streamline Plumbing 24 hours a day, 365 days a year. We understand that plumbing issues can arise anytime and we are here to help ease your mind. With over 25 years experience servicing homeowners here in Southern California, we have built a reputation for always taking care of the customer and always offering affordable prices. So if you just found a faucet that is spraying water, or if you knew about a problem that got worse and can’t wait until the morning, call us today for our emergency plumbing service.